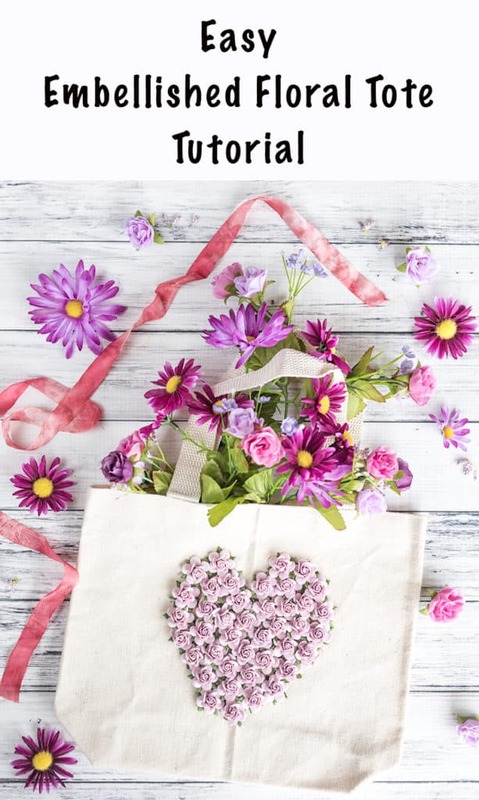 So, in my mind this embellished floral tote tutorial was going to written and posted long before Mother’s Day… I guess technically it is, as long as we’re talking about Mother’s Day of next year! 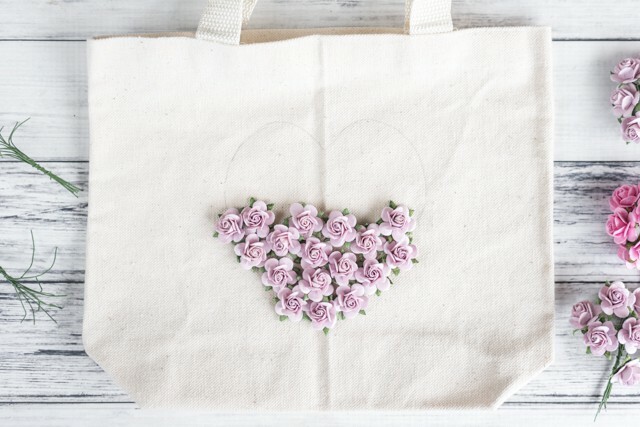 But, as they say, better late than never, so here’s today’s easy embellished floral tote bag tutorial! I really like mulberry paper flowers. 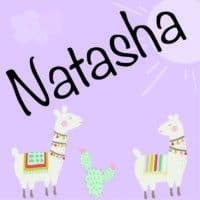 They’re so cute and affordable! They are not waterproof, though, so if you like piña coladas and getting caught in the rain you might want to use ‘silk’ artificial flowers. I try really hard to not get rained on, which is much easier to do in South Carolina than it was in Hawaii, so I figured paper flowers would be fine for me. You can use this same technique for other designs, too, so feel free to make something other than the provided heart! 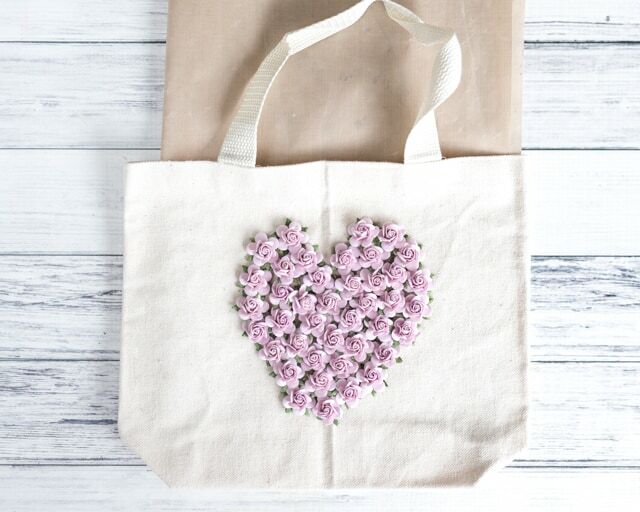 A canvas tote bag to embellish. I used an 8.5 x 11 tote (it was in a 4 pack at Hobby Lobby) that would be super cute as a lunch bag! Paper heart template. 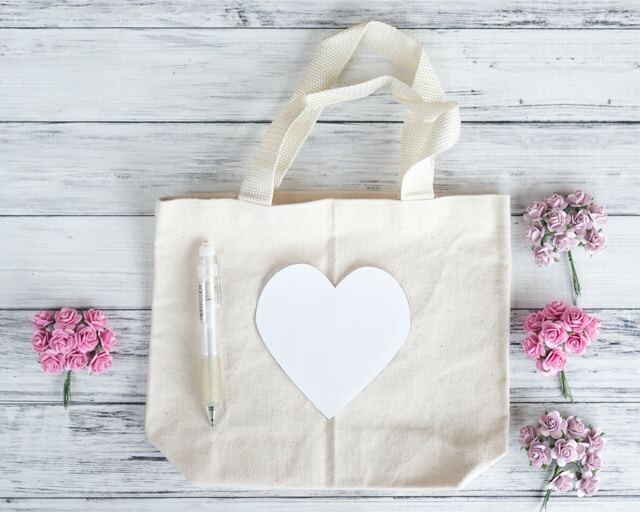 You can make your own or download this free printable heart template here. It’s sized for the bag I used – just print and more or less than 100% to size it for other bags. Mulberry paper flowers or other artificial flowers. I purchased mine from Really Reasonable Ribbon. Wire cutters or cutting pliers. A pencil or disappearing ink fabric markers. I used my trusty .9 mm Sumo Grip pencil. Adhesive. I used Original Tacky Glue. Hot glue would probably work, too, as would a fabric adhesive. A piece of plastic packaging, silicone or Teflon mat, crafting mat, etc. to keep glue from leaking through and gauging your bag together. I used a Teflon crafting sheet. Download, print, and cut out your heart template. (Forget to download it above? Grab you free heart template here.) Position it on your tote bag and then trace it. You can use a fabric marker, but a pencil is just fine since you’ll be covering it up, anyway. Cut your flowers off their stems using a pair of side cutting pliers wire cutters. Sturdy scissors will do in a pinch if you cut right at the base of the jaws. Snip as close to the flower base as possible. I highly recommend that you do a ‘dry fit’ to play with flower placement before bringing out the adhesives. I just cut a few flowers off at a time as I placed them so I wouldn’t end up cutting way too many. After you’re happy with how your heart looks, begin gluing. 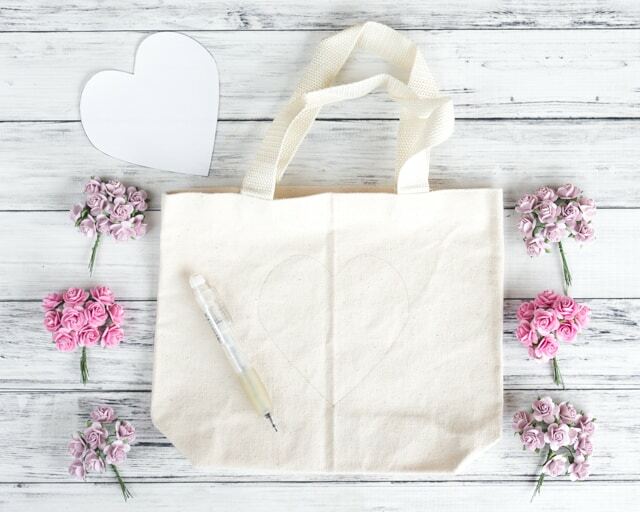 Insert a piece of plastic packaging, crafting mat, or something else nonporous in your tote bag to act as a barrier if you’re concerned about glue leaking through. I didn’t have any problems, but I feel that it’s better to be safe than sorry! To glue the flowers, I place, I lifted them a few flowers at a time, applied a large dollop of Original Tacky Glue, and then pressed them back into place. 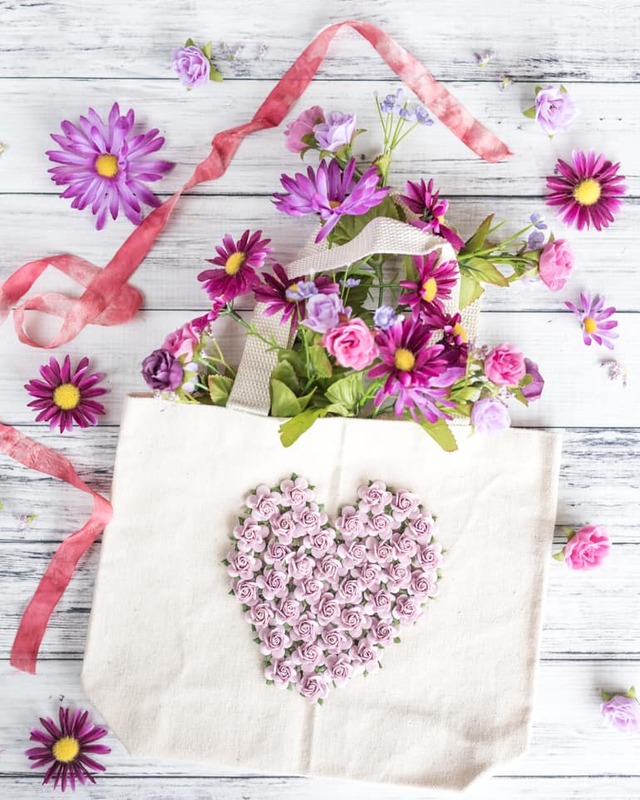 Allow glue to dry fully (check your glue bottle for approximate drying times), remove the protective material, then use and enjoy your new embellished floral tote! You already know my May has been quite busy. How’s your May going? Any big projects or plans for summer? Thank you! I’m sad I’m now out of that color of paper flower. I’ve used them for a lot of things over the past couple of years!